In recent years, there has been a movement toward razors using multiple blades as a way to get a cleaner, easier shave. The same trend has also occurred in rechargeable electric shavers, particularly those that can be used either wet or dry. The Panasonic ES8243A is a four blade wet and dry rechargeable electric shaver that will give you the ultimate shaving experience no matter what kind of beard or skin you have. What Is the Panasonic ES8243A? This has the patented four blade ultra-thin cutting system with 30 degree nano blades which have been shown to make shaving extremely easy, comfortable, and safe. The 13,000 CPM linear motor driver of the Panasonic ES8243A will help you to get the closest shave possible without pulling or tugging, and this also has a flexible pivoting head to ensure that you can get around every contour of your face and neck. What Features Does the Panasonic ES8243A Have? The most unique feature of the Panasonic ES8243A is the four blade cutting system and the larger pivoting head. These both help to make shaving a lot easier and quicker for many guys, and combined with the flexible pivoting head, shaving quickly and efficiently will be no problem at all. One feature that a lot of men like about the Panasonic ES8243A is that it has a turbo mode, during which the motor can be revved up to 17,000 RPM, which will help to clear the razor of any excess hair is or debris. This helps to ensure that you get the cleanest shave possible every morning and also protects the life of the shaver. Other features include a pop-up trimmer, automatic universal dual voltage charging, an included lithium-ion battery, and a charger and travel bag. There are certainly a lot of reasons to purchase the Panasonic ES8243A, not least of which is its ability to provide a close, comfortable, and rapid shave. If there is a downside to this model, it would be that it does not have a travel lock switch or an automatic cleaning system, though by increasing the speed of the motor, it can automatically clean itself in a matter of seconds. It has an approximate 45 minute usage time, and takes only one hour to reach a full charge. What Do Real Men Say About the Panasonic ES8243A? 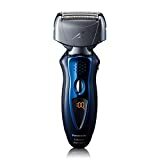 When you start to read the reviews for the Panasonic ES8243A, you will see that this four blade technology is one of the reasons why a lot of guys choose this model, and with the expanded cutting surface, it makes for a much quicker and easier shave every day. For men who have sensitive skin, this kind of shaver is obviously a better choice than a traditional razor, and enables them to get a close shave without putting undue stress on their skin. These four, arced blades also help to prevent next and cuts, resulting in a smoother shave overall. Where Can You Get the Best Buy on the Panasonic ES8243A? You might be able to find this at a local wal-mart or walgreens store. I do not that you can find it on amazon for sure. Is This the Best Shaver for You? If your existing electric razor only has two or three blades, then you might be a little surprised at what a difference an extra blade can make. With a powerful 13,000 CPM motor, and a fully flexible, pivoting head, you will probably find that the Panasonic ES8243A is not only a very good buy, but the best electric razor you have ever had. ← What Are the Key Differences Between the 760cc and 790cc?